How do I begin? 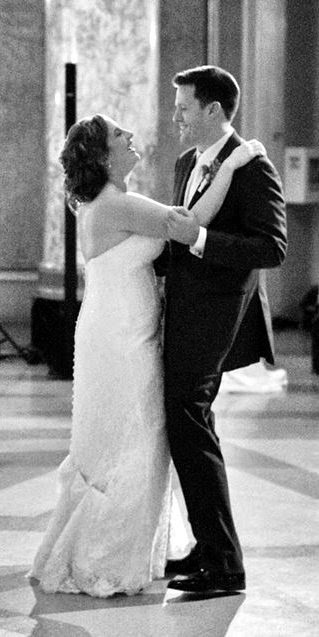 My niece, Maggie, got married this weekend to the perfect man for her. I'd like to describe their wedding, but it was so unique I fear I will not catch the whole flavor of it....but let me try. 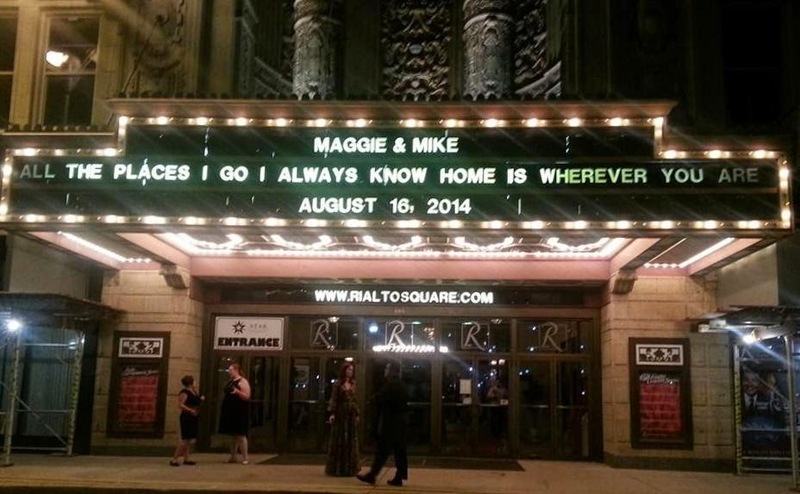 Maggie and Mike met while doing community theatre. 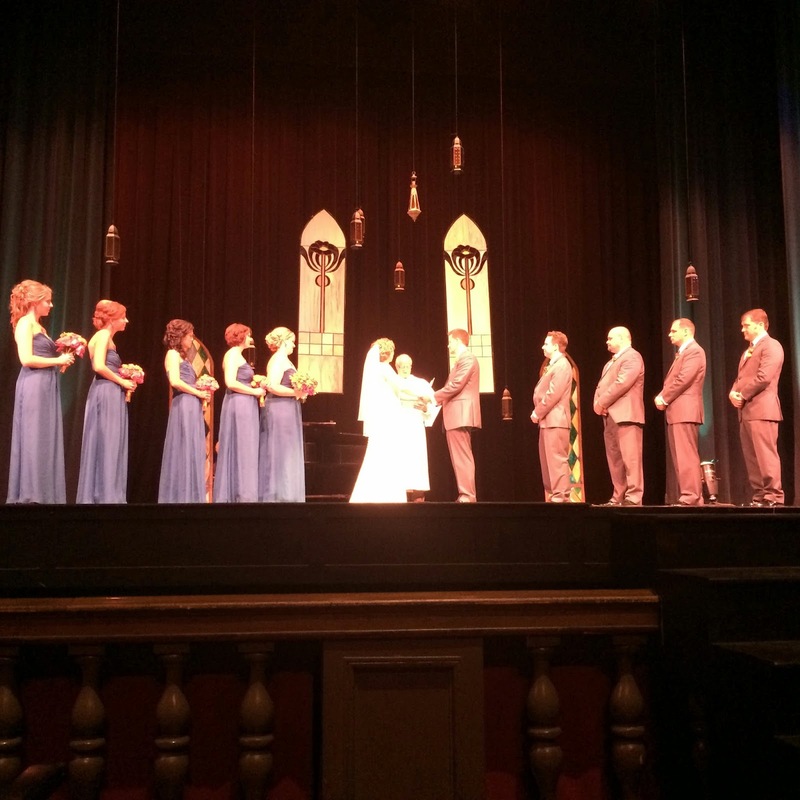 Mike proposed at a theatre...and so, of course, they had a theatre themed wedding. 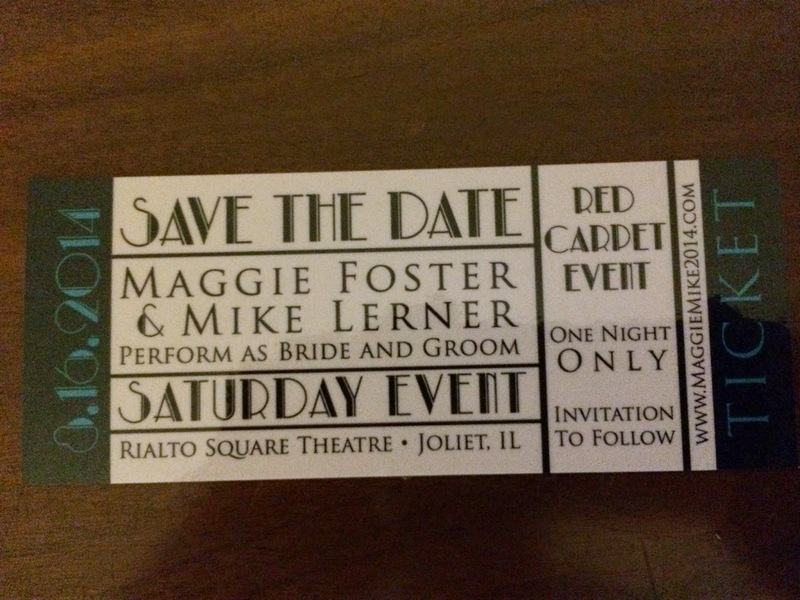 It began with the "Save the Date" magnet that looked like a ticket for a play. 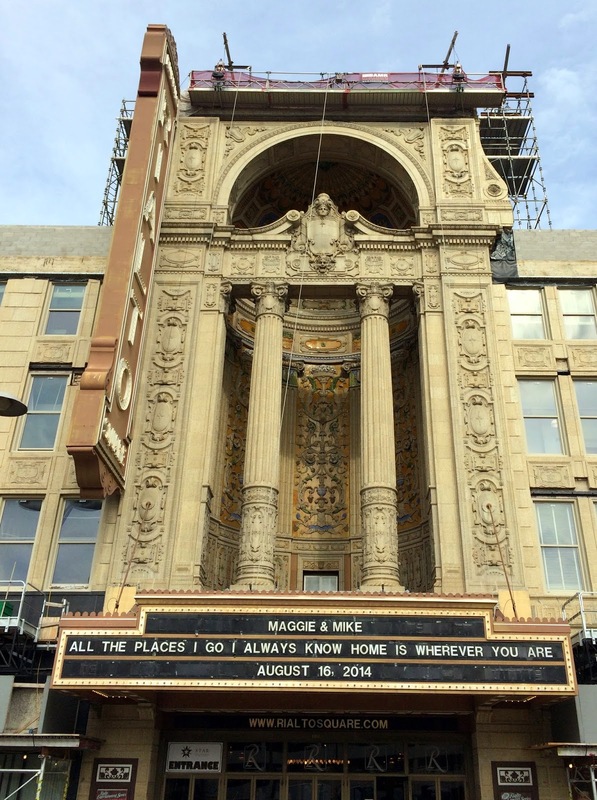 The wedding venue was the Rialto Theater in Joliet, Illinois. 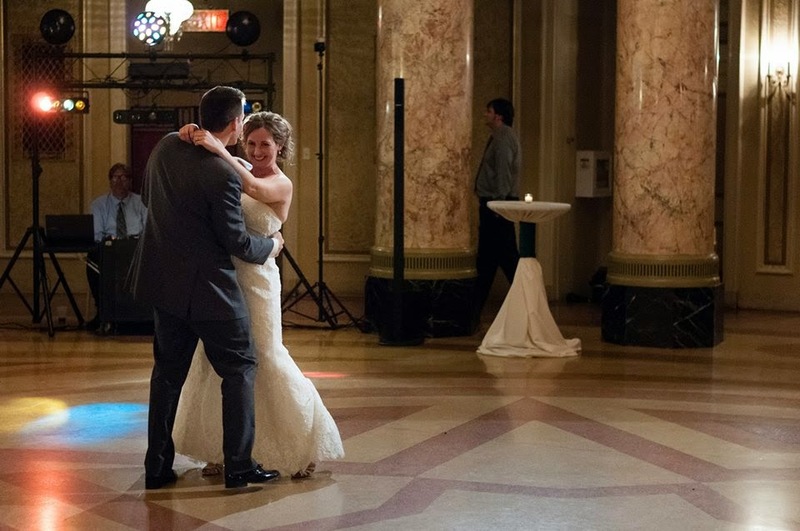 The reception was in the lobby. The pictures will convey the beauty of this place. It reminded me of some of the places we visited while traveling in Europe this summer. In fact, Ray wondered if it was patterned after The Hall of Mirrors at Versailles. 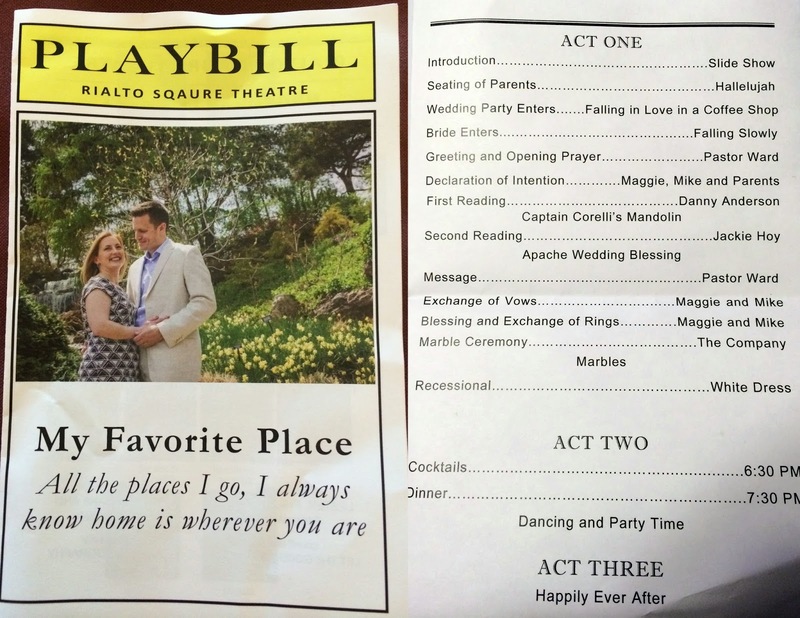 Here is a quick outline of the wedding: The program was a playbill. 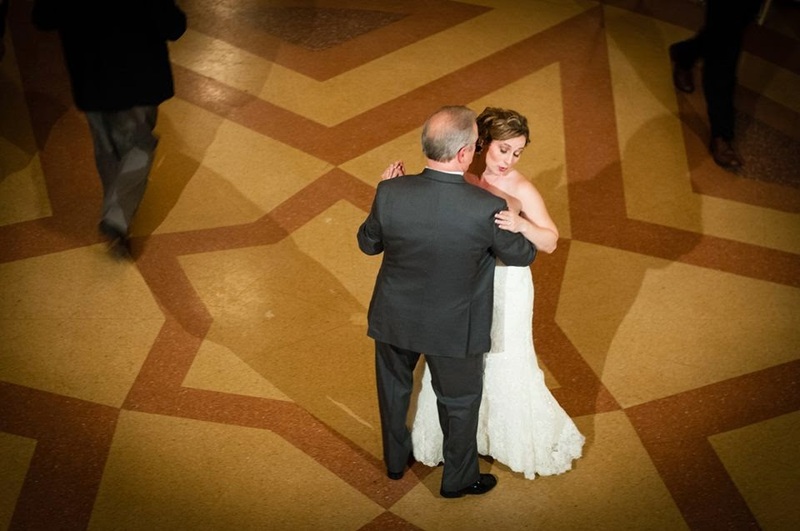 The play (wedding) was "My Favorite Place." It began with a slideshow (created by Maid of Honor, Sarah Ward) projected on the big screen. We all felt like we were at the movies. 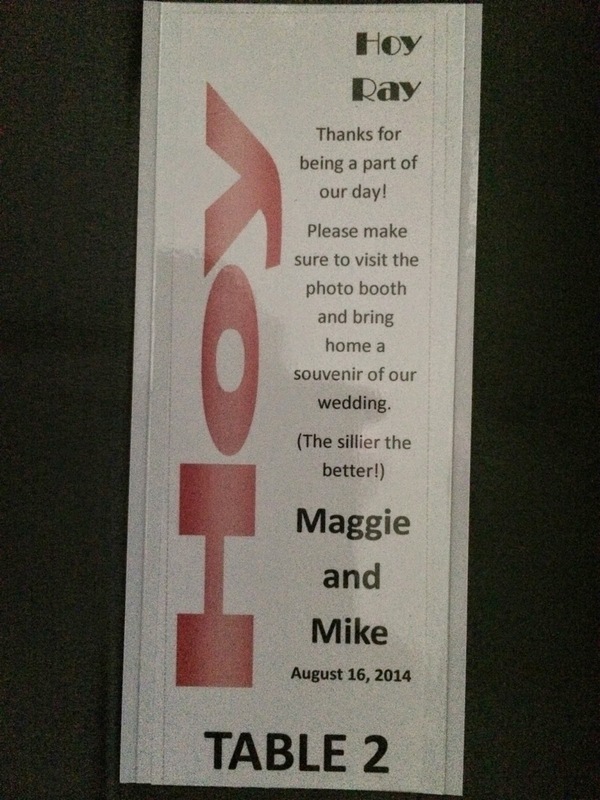 Mike and Maggie wanted their wedding to be fun for all. 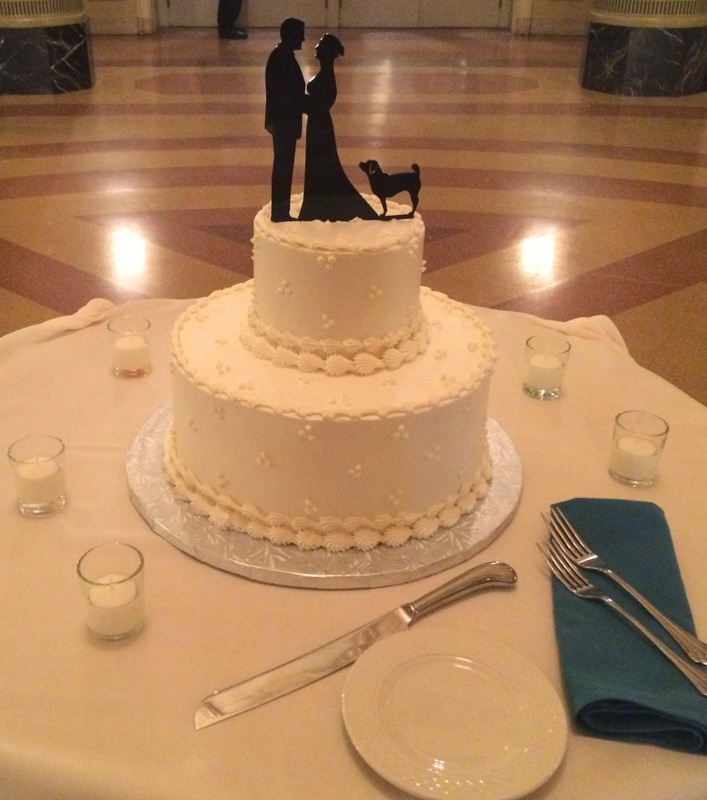 I began to wonder if the whole wedding was going to feel like a play...a production. Part of me was relieved because I had been asked to do a reading...and I feared I would begin to cry while reading it. Hmmm...I can just picture myself as an actor in a play and be able to distance myself from the emotions that were surging through my body while watching pictures of Mike and Maggie. Wasn't that cool? You can hear the audience clap and shout. Yes, I did say 'audience', because it felt like that. This was fun! But a tiny part of my mind kept wondering if the solemnity was going to be lost in all of the fun. I stuffed that thought down deep, sat back and tried to relax knowing I still had my reading. This was the view from my seat...and then my battery died. 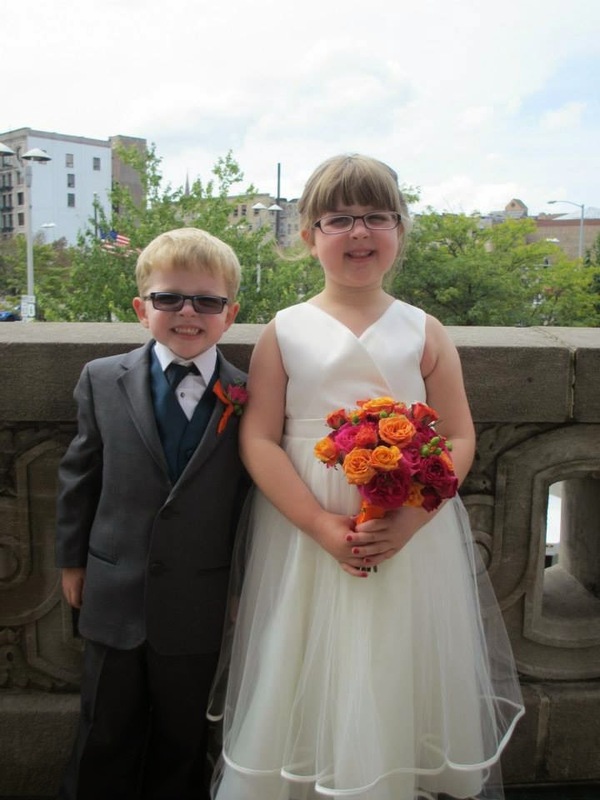 Next came the bridesmaids, the flower girl and ring bearer. Such grace, the bridesmaids glided up the steps. Of course, the flower girl (Abby, my great niece) and ring bearer (Jackson, my great nephew) brought "ahs" and "oohs" from the guests. (Yes, now we were guests...no longer just an audience). I have another video that is a must see. Jackson was to have left with his sister to be with their mother for the rest of the ceremony. Instead, he decided to stay...for awhile. Check this You Tube to enjoy a bit of Jackson during ceremony . I will spare you the video of me reading "Apache Wedding Blessing." I did get through it with no tears, so I felt it was successful. My sister's brother-in-law, Danny Anderson, read "Captain Corelli's Mandolin" before I did my reading. Both went well...and then time for exchanging vows. They had written their own vows and by the time they were finished I was choking back tears. That tiny part of my mind that was so concerned with the ceremony being too light hearted (frivolous) settled back...satisfied that those vows spoken were to most touching I have ever heard. Listen to them and you will agree that these two love each other to their very souls. If the video does not work, this link will take you to Wedding vows . I will put a few pictures to end this post. My camera's battery died at the beginning of the ceremony (play) so I am using my nephew's (Nathan) and a few from Ray. where we were to be seated. 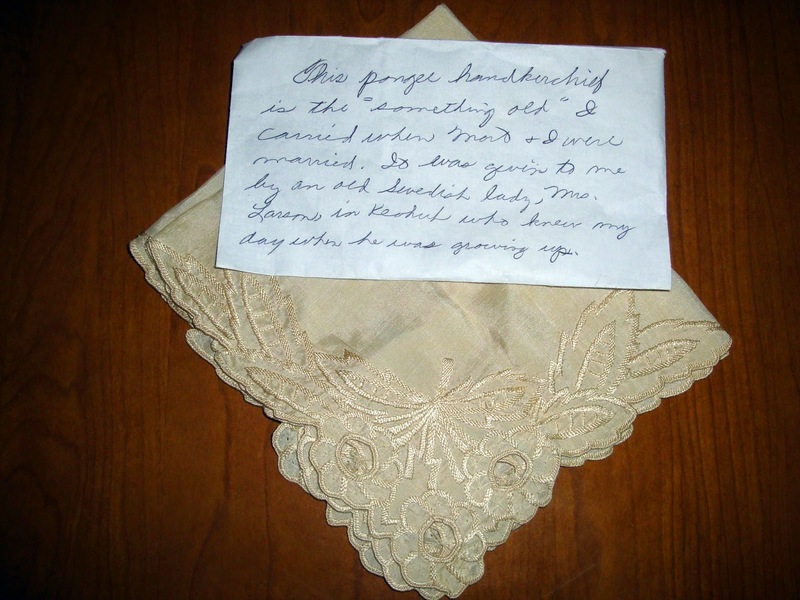 Maggie carried this handkerchief that my mother (her Nana) carried when she married my father. It was nice knowing that Nana and Papa were represented for this special time. Maggie also asked her mother (my sister) to cut a heart shape from one of Geoff's (her step-father who had died less than two years ago) shirts and sew it in the hem of her dress. Just another example of how thoughtful Maggie is and how she wanted to include people who had been special in her life. This is a short slide show of Abby and Jackson. Thank You, Ray, for helping with the videos and the You Tube. Jackie, Thank you for putting this together. The whole day was a blur for me! What a fantastic venue for a wedding. Looks like a beautiful event! What a beautiful and unique wedding! The day was memorable I am sure! Wow! I don't know what else to say. What a unique and memorable ceremony. I wish them both a long, happy life together, Thanks for sharing this special day.